There are great teachings in all world religions. There have been many great prophets outside of the Christian tradition that have provided wisdom for the human family. Many religions have traditions of a historical figure as the personification of God, each showing different aspects of how they view God. But nothing speaks to me like the teachings and doctrine of Jesus Christ. These lyrics from U2 capsulize what it is to believe in Jesus Christ. He taught peace, sacrifice, love, discipline, and mercy. We love and revere God by treating others the way he taught. He taught and exemplified how to live. But he also offers the enabling grace we need to follow his example. A Christ-centered-LDS life is one that takes the call of the Savior to come unto him and have your sins and weakness be perfected in him. Within the LDS metaphorical paradigm, there can be two views of Jesus Christ. 1) Jesus is the literal Son of God, the Savior of the World, a resurrected being who takes his place in the godhead, one with his Father in Heaven yet a separate being. 2) Scripture is meant to be understood metaphorically. Jesus Christ was an inspired man that taught inspired teachings and exemplified the true character of God. In this, he is a symbol of the Son of God. A symbol of the personification of God. We can worship him and express faith in him, because we know if there was a personification of God, it would be exactly as we understand Jesus Christ. Regardless of whether you believe in Jesus Christ as a literal or symbolic representation of God, we believe through Jesus Christ we can live more abundantly in this life and be saved and live with God again. I believe in Christ and confess him not like some child; my hosanna has passed through an enormous furnace of doubt. I want to say to you, about myself, that I am a child of this age, a child of unfaith and scepticism, and probably (indeed I know it) shall remain so to the end of my life. How dreadfully has it tormented me (and torments me even now) this longing for faith, which is all the stronger for the proofs I have against it. And yet God gives me sometimes moments of perfect peace; in such moments I love and believe that I am loved; in such moments I have formulated my creed, wherein all is clear and holy to me. This creed is extremely simple; here it is: I believe that there is nothing lovelier, deeper, more sympathetic, more rational, more manly, and more perfect than the Saviour; I say to myself with jealous love that not only is there no one else like Him, but that there could be no one. I would even say more: If anyone could prove to me that Christ is outside the truth, and if the truth really did exclude Christ, I should prefer to stay with Christ and not with truth. These are some of the teachings that move me. They help me become a better person. They help me live with more joy, peace, and happiness. Mark 8.34-36 whosoever will save his life shall lose it; but whosoever shall lose his life for my sake and the gospel’s, the same shall save it. Matthew 5: 16 Let your light so shine before men, that they may see your good works, and glorify your Father which is in heaven. 42 But Jesus called them [to him], and saith unto them, Ye know that they which are accounted to rule over the Gentiles exercise lordship over them; and their great ones exercise authority upon them. 10 Blessed [are] they which are persecuted for righteousness’ sake: for theirs is the kingdom of heaven. From these, we get a picture of a message of peace, love, service, and sacrifice. He taught by not just his words but his actions. These passages are from the Bible NIV version. I took it from NIV because it’s a little easier to read and understand in story form. 2 Now there is in Jerusalem near the Sheep Gate a pool, which in Aramaic is called Bethesda and which is surrounded by five covered colonnades. 3 Here a great number of disabled people used to lie—the blind, the lame, the paralyzed. 5 One who was there had been an invalid for thirty-eight years. 6 When Jesus saw him lying there and learned that he had been in this condition for a long time, he asked him, “Do you want to get well?” 7 “Sir,” the invalid replied, “I have no one to help me into the pool when the water is stirred. While I am trying to get in, someone else goes down ahead of me.” 8 Then Jesus said to him, “Get up! Pick up your mat and walk.” 9 At once the man was cured; he picked up his mat and walked. 11 Now on his way to Jerusalem, Jesus traveled along the border between Samaria and Galilee. 12 As he was going into a village, ten men who had leprosy met him. They stood at a distance 13 and called out in a loud voice, “Jesus, Master, have pity on us!” 14 When he saw them, he said, “Go, show yourselves to the priests.” And as they went, they were cleansed. 15 One of them, when he saw he was healed, came back, praising God in a loud voice.16 He threw himself at Jesus’ feet and thanked him. 18 While he was saying this, a synagogue leader came and knelt before him and said, “My daughter has just died. But come and put your hand on her, and she will live.”19 Jesus got up and went with him, and so did his disciples…23 When Jesus entered the synagogue leader’s house and saw the noisy crowd and people playing pipes, 24 he said, “Go away. The girl is not dead but asleep.” But they laughed at him. 25 After the crowd had been put outside, he went in and took the girl by the hand, and she got up. 4 …He took off his outer clothing, and wrapped a towel around his waist. 5 After that, he poured water into a basin and began to wash his disciples’ feet, drying them with the towel that was wrapped around him. 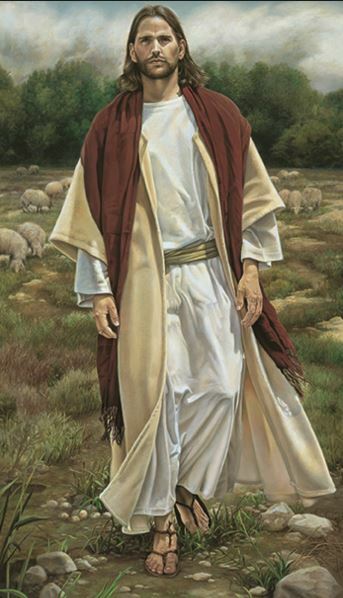 …12 When he had finished washing their feet, he put on his clothes and returned to his place. “Do you understand what I have done for you?” he asked them. 13 “You call me ‘Teacher’ and ‘Lord,’ and rightly so, for that is what I am. 14 Now that I, your Lord and Teacher, have washed your feet, you also should wash one another’s feet. 15 I have set you an example that you should do as I have done for you. 36 Then Jesus went with his disciples to a place called Gethsemane, and he said to them, “Sit here while I go over there and pray.” 37 … and he began to be sorrowful and troubled. 38 Then he said to them, “My soul is overwhelmed with sorrow to the point of death.”…39 Going a little farther, he fell with his face to the ground and prayed, “My Father, if it is possible, may this cup be taken from me. Yet not as I will, but as you will.”…42 He went away a second time and prayed, “My Father, if it is not possible for this cup to be taken away unless I drink it, may your will be done.”….44 So he left them and went away once more and prayed the third time, saying the same thing… (Luke 22 44) And being in anguish, he prayed more earnestly, and his sweat was like drops of blood falling to the ground. 50 And one of them struck the servant of the high priest, cutting off his right ear. 51 But Jesus answered, “No more of this!” And he touched the man’s ear and healed him. 28 They stripped him and put a scarlet robe on him,29 and then twisted together a crown of thorns and set it on his head. They put a staff in his right hand. Then they knelt in front of him and mocked him. “Hail, king of the Jews!” they said. 30 They spit on him, and took the staff and struck him on the head again and again. 31 After they had mocked him, they took off the robe and put his own clothes on him. Then they led him away to crucify him. 33 When they came to the place called the Skull, they crucified him there, along with the criminals—one on his right, the other on his left. 34 Jesus said, “Father, forgive them, for they do not know what they are doing.”… 44 It was now about noon, and darkness came over the whole land until three in the afternoon, 45 for the sun stopped shining. And the curtain of the temple was torn in two. 46 Jesus called out with a loud voice, “Father, into your hands I commit my spirit.” When he had said this, he breathed his last. Peter was hurt because Jesus asked him the third time, “Do you love me?” He said, “Lord, you know all things; you know that I love you.” Jesus said, “Feed my sheep.